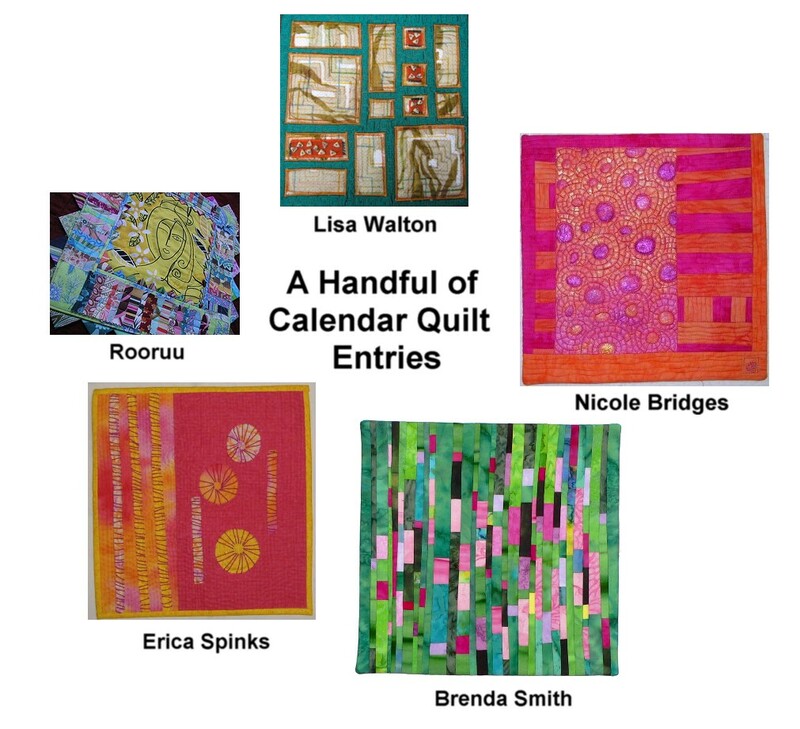 Is your favourite quilting business advertising in guild's newsletter, The Template? The Template reaches 1000 dedicated quilters every quarter, a worthwhile market for any quilting business, and our quilt show is the largest in Australia, with entries from members across Australia. Advertising rates start from $82.50 (inc GST) for an eighth of a page ad, with discounts for ads running over four consecutive issues - see our advertising brochure for more details. The deadline for submissions for the next [March 2007]issue of The Template is 8 January 2007 so don't delay! Apologies to any subscriber that received multiple updates overnight. This happened because yesterday this blog was upgraded to Beta Blogger. In the process, some of the layout was also a little scrambled so you may notice some "tweaking" from time to time as I get images of those lovely Mini Marvel quilts back into the side bar. The good news is that the new format enables "labels" to be applied to posts. This means that you can quickly find all blog entries relating to Quilt Show 2007 or Workshops and so on by clicking on the relevant label at the end of the post. Try it and see what I mean! If the young quiltmaker (or prospective quiltmaker) in your home is at a loose end over the holidays, why not encourage them to make a quilt to enter into Sydney Quilt Show 2007? There are some great prizes on offer including an encouragement award of Bernette 80E sewing machine generously sponsored by Bernina. 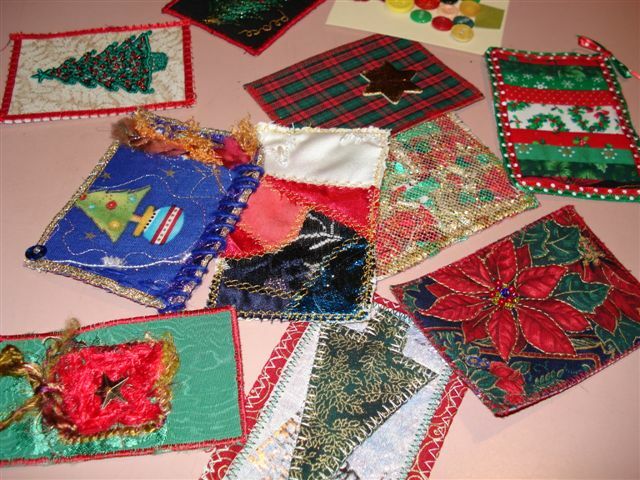 What's more, there is no entry fee for guild members under 18 years of age to enter their quilts into the show. Visit the guild website to view other winners of the Junior Member A (up to 12 years) and Junior Member B (13-18 years) categories from last year's quilt show and to download a membership application form. The Meroogal Women’s Arts Prize is a regional non-acquisitive competition and exhibition across the fields of visual arts, crafts and design. It is open to a work using any media made by a woman 18 years and over who is a resident of the south coast and greater Illawarra region. This year's exhibition with the theme Reduce, recycle & renew at Meroogal includes Lisa Johnson's striking woollen quilt "Red Blankets Are Warmer" and Judith Bentley's wagga-style quilt "John's Jumpers". How good does Tanya Coxsedge's quilt look on the cover of The Template? Tanya won the Guild's 2006 Challenge, Going to Pieces. In this issue, she writes about making this quilt - not an easy task, with such a confronting image being stitched. 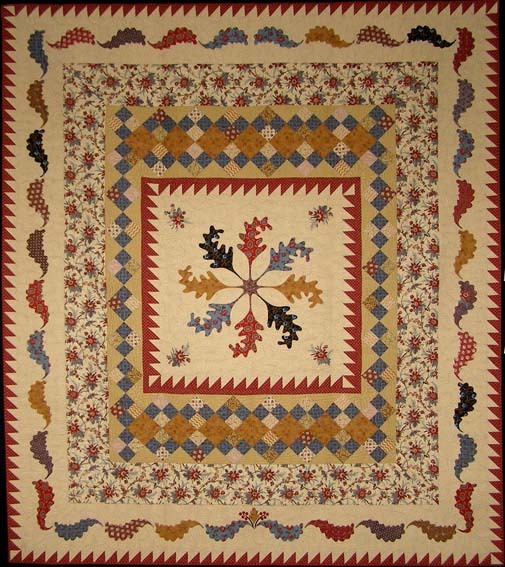 In each issue, you'll find a piece about the cover quilt, so you can find out its story. This was one suggestion from the Guild's recent survey - the committee received lots of valuable input from this and is working through it all. This issue doesn't use the usual Template masthead - mostly because the quilting hoop/needle would have done unkind things to Tanya's head! I really enjoy the NSW Quilters' Guild challenges, for they force me to consider ideas I wouldn't have imagined on my own. Read more about the Guild's 2007 Challenge, Looking Forward : Looking Back. 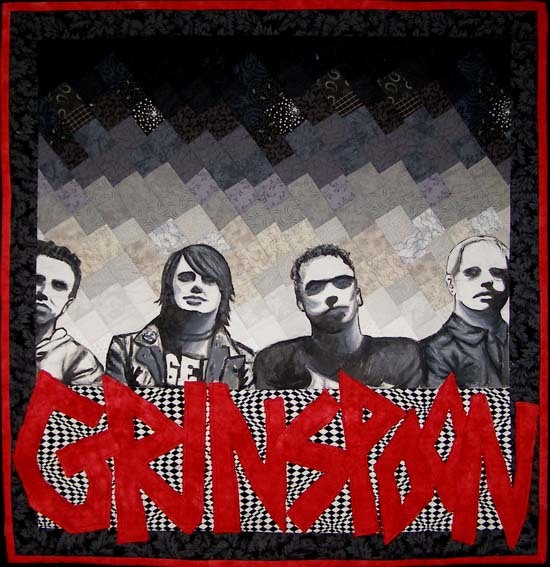 Entry doesn't close until September 2007, and is open to all Guild members. Look for your copy of this issue (Vol. 25 No. 1) in your letter box in mid-January. Well almost...the Sydney Quilt Show 2007 will be at the Darling Harbour Exhibition Centre from 27 June to 1 July 2007. The forthcoming issue of The Template includes an article setting out ways you can help make this 25th members' exhibition the best show ever. 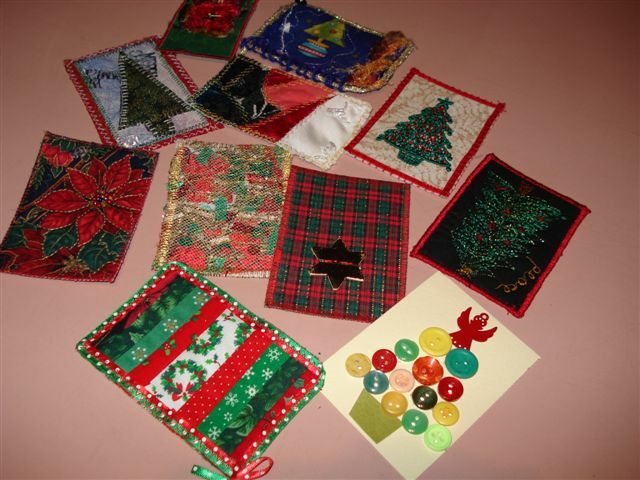 Pending the mail out of the entry form, here is a link to the categories and conditions of entry for Quilt Show 2007. These details are also set out in the attached pdf (60KB) document. This is the beautiful Feather Medallion raffle quilt made by St Ives Quilters. 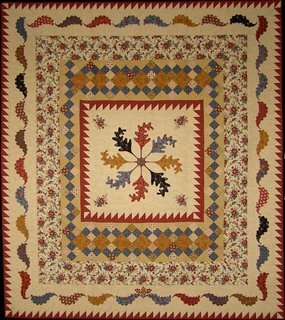 The needle turn applique is just exquisite and is complemented by machine quilting by Jenny Campbell of Coastal Quilting. Coming soon, is the answer. If you'd like a taster of the contents of the new look Template, check The Template page on the Guild website - click here. As the Guild's newsletter, it's packed with Guild news - and I do mean packed, it's remarkable how many activities are undertaken under the Guild's umbrella. So many people doing great work. 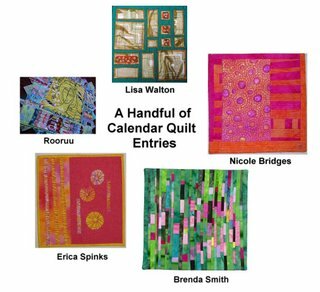 The quilts will be on display at the 25th Sydney Quilt Show in June 2007 and the calendars for 2008 will be on sale. 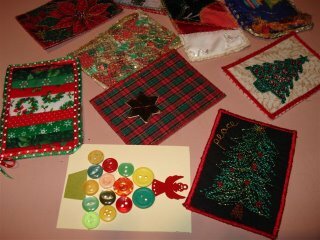 The quilts will then become another suitcase exhibition available to groups. By the way, Lisa Walton, Nicole Bridges, Brenda Smith, Erica Spinks and rooruu also happen to have blogs and you will find links to their blogs on the side bar. If you are a guild member and would like your blog to be added to the list, please contact the Guild Webmaster. Today is the final Guild general meeting of the year and, as a kind of Christmas present to Guild members, we will be officially launching this Guild blog. Welcome to all new readers who are visiting for the first time! Neither of these services will notify you if comments have been left on the Guild blog. Nevertheless, we hope that you will leave comments from time to time as this is part of the fun of blogging and blog reading. Comment moderation has been set up on this blog which means any comments will be reviewed and approved before they show up but we anticipate that most messages will be cleared promptly. Alternatively, if you have a news item that you think might be suitable for posting on the blog, you can e-mail details to the Guild Webmaster. Please contact the Guild Webmaster if you require assistance.